‘The show must go on’, they say. With 11 Main House productions and half a dozen In the Bar shows every year, BLT needs a constant supply of backstage volunteers to help. It’s great fun and you don’t need experience – just enthusiasm! If you are helping out at shows with Front of House, Kitchen, Bar or Box Office Duties access the volunteering schedule here with the password you have been given. If you are already helping out by delivering leaflets access the volunteer schedule here with the password you have been given. During rehearsals, the Stage Manager takes note of cues, moves etc in the script. Once the show is in performance, the SM’s job is to ensure props (items needed by the actors) are in place, check the stage to make sure everything is where it should be, give cues to the sound effects and lighting operators, communicate with Front of House and generally run the show. Also attends rehearsals, sources props, notes where and when they should be used and ensures they’re in place. May also be required to move scenery and/or onstage furniture, depending on the show. Attends rehearsals and follows the script, prompting actors when they forget their lines. 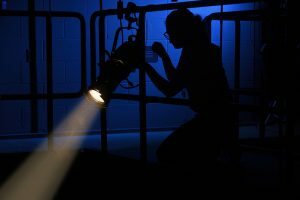 Occasionally the director of the play does this, but often a set designer is called in and works closely with the Director to ensure the design is right. If you’ve got an eye for design, this could be for you. You don’t have to be a professional joiner or decorator – if you can knock a nail in or wield a paint brush, this is for you!! Work begins on the Sunday following the last night of a show, when the set for the next show begins to take shape and continues during the following couple of weeks. You don’t have to be there each time – even if you can only spare a couple of evenings that would be very helpful! The lighting is different for every show. The designer sets up all the lights and cues during rehearsals on stage, usually during the final week of rehearsals. This involves compiling pre-show and interval music and sound effects for the play. The designer then puts everything together in order of cues on our sound box computer. 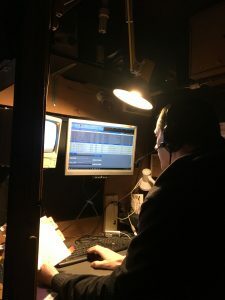 BLT’s lighting and sound control boards are completely computerised so, once the designers have set up the lighting and sound, operators only have to press a button when given a cue by the Stage Manager. Easy peasy! With a season of plays ranging across cultures and eras, we are constantly needing to source costumes appropriate for each production. We have our own extensive wardrobe department, but also hire costumes from outside agencies. Whether you are handy with a needle and thread or just have an eye for putting an outfit together, BLT’s wardrobe team needs you! Whichever role you’re interested in, working backstage on a show requires a certain level of commitment, but it’s also a lot fun and a great feeling of camaraderie is built up between cast and crew. If you want to know more about joining the backstage family at BLT, please contact Pat Jones. We would love to hear from you! We are always keen to audition new actors for our shows. Please see our auditions page for more information.